The Icon of Our Lady of Czestochowa has been in Ecuador since April. 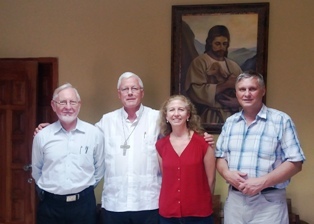 She visited 29 parishes of the diocese of Santo Domingo. Many faithful looked into the eyes of the Black Madonna and have felt the maternal embrace of Her protection. 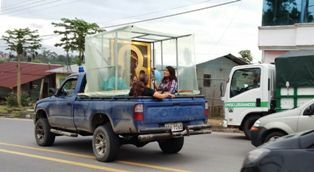 To be available to all of her children, She even traveled in the back of a pickup car to reach the inaccessible areas of the countryside. After almost a month in the parish of Blessed Virgin Mary of Mercy in Tandapi, Our Lady in Her Czestochowa Icon left the inhabitants of the region. Geographically the town of Tandapi is a part of the Mejía Canton in the province of Pichincha, but for pastoral reasons belongs to the diocese of Santo Domingo. With great clamor and very excited, the parishioners received the Icon of Our Lady in the Parish of Christ the King and Immaculate Conception. The dean of the place, Fr. Victor Saragosin, accompanied Her every day. She visited a number of communities such as Nanegalito, Dos Puentes, Tandayapa, Miraflores, San Sebastian, Santa Elena, Cartagena, Tulipe, Las Tolas, Gualea Cruz, San Jose de Porvenir, Manchuri, among others. On Sunday, June 11, the Icon of Our Lady of Czestochowa arrived at the Parish of the Mother of the Good Shepherd, in Nanegal. Here She was received with great joy by the residents who gathered in the Nanegal Educational Center where they began the visitation by crossing the central park, walking two kilometers to the parish church. The faithful of St. Vincent Ferrer Parish in Mindo received the Virgin with great joy and devotion. The Icon arrived on Friday, June 9, and stayed until Sunday, 11th. For Fr. Jean Baptiste Fils the parish priest it was a good experience that greatly encouraged the Marian devotion of the parish. "It has been a great experience with our Mother," he said. 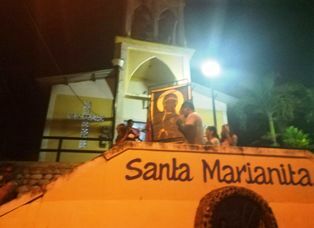 The parishioners went to the previous parish to receive the Icon and took Her to their own Church of Saint Michael Archangel in Los Bancos. She stayed here for the weekend. On Monday She was transferred to the St. Barnabas district. It was very emotional, since it was the saint's feast, the feast of the Apostle. The tour of Our Lady in Her Czestochowa Icon reached the parish of the Our Lady of Cisne, in the village called Celica. It is interesting to know that Celica is also a place in the province of Loja the southernmost part of Ecuador. Group of Lojanos came to this area and settled here. 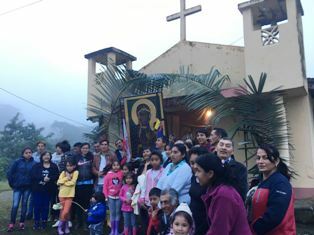 From May 27 to May 30 the icon of Our Lady of Czestochowa visited the Parish of Our Lady of Carmen and the city of Puerto Quito. This city is in the Pichincha province, but belongs to the northwest part of the Diocese of Santo Domingo. 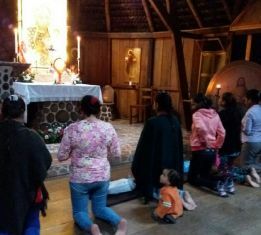 The Virgin arrived at the parish center from Andoas the St. Vincent Ferrer Parish, visiting on the way the Santa Marianita community within the jurisdiction of Puerto Quito. 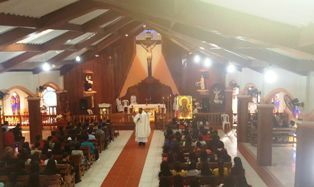 The Icon of the Blessed Virgin, during her tour in the province of Santo Domingo, visited the parish of St. Vincent Ferrer in the community of Andoas, the north-west part of the diocese. She was very welcomed by the parishioners, so much that even a sporting event was suspended so it would not interfere with the reception of the Mother of God. Agnus Dei is initially a German community established in Santo Domingo with the intention of contemplative life. They came to Ecuador 20 years ago invited by the bishop of Santo Domingo. They work closely with Radio Maria, and for the last 8 years they have had perpetual adoration in their chapel.